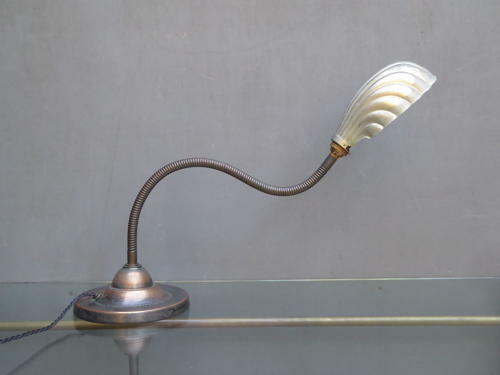 An exceptional original antique copper 'gooseneck' desk lamp. A beautifully simple & early desk lamp of larger than average proportions with a heavy base, long flexible 'goose neck' stem & original nickel plated clam shell shade. The whole lamp has a wonderful patina & it has been rewired in twisted black flex. A superb example. Wear commensurate with age, excellent overall, holds position perfectly. Measurement refers to the lamp at full stretch.